Uma pedra tradicional construída villa mobilada com um alto padrão com o benefício de wifi. Há degraus até a sua própria piscina privada, duche exterior e área de banhos de sol. Situado em uma pitoresca vila intacta, com uma rua principal de paralelepípedos e ruas estreitas e sinuosas, ideal para um passeio à tarde. A propriedade é composta por 3 quartos com 2 en-suite e uma grande varanda no andar de cima para se bronzear ou refeições ao ar livre, enquanto aprecia a vista panorâmica da montanha. Alternativamente, há uma atraente área para churrasco situada entre um jardim estabelecido. A sala de estar é espaçosa e elegantemente decorada com um fogão a lenha para noites de inverno aconchegantes, com o benefício adicional de radiadores elétricos. Para jantar fora ou tomar uma bebida à noite, existem 2 tabernas e 2 cafés cipriotas a cerca de 4 minutos a pé. Há também um mini-mercado no topo da vila. 4 campos de golfe de alta qualidade estão dentro de uma movimentação de 30 minutos com Minthis Hills sendo apenas 5 minutos de distância. Cidade de Paphos, com suas muitas lojas, restaurantes e cafés e praias locais estão dentro de uma movimentação de 20 minutos. A casa tem 3 casas de banho. casa de banho para o quarto 1 com duche, lavatório e wc. casa de banho para o quarto 2 com chuveiro, lavatório de banho / mão e wc. casa de banho piso térreo com chuveiro, lavatório e wc. Notas sobre alojamento: A propriedade tem o seu próprio estacionamento fora da estrada com degraus que levam até a vila. Ao abrir a porta você é recebido com uma área de estar iluminado e arejado, 2 conjuntos de portas do pátio levar para uma varanda e os passos para baixo para uma área de piscina privativa com duche e espreguiçadeiras fora. Todos os quartos são totalmente climatizados, com roupeiros embutidos. A varanda no andar de cima tem uma mesa e cadeiras ideal para alguma paz e sossego. A área do pátio térreo também tem uma mesa e cadeiras e fica perto do churrasco tradicional cipriota. A propriedade está cheia de carácter, com seus 3 níveis diferentes proporcionando a oportunidade de solidão e reflexão. Para uma noite tranquila, há televisão por satélite (Nile SAT) DVD, rádio CD, livros, cartões e quebra-cabeças. Um carro é essencial para lojas, visitar locais de interesse cultural e exploração ilha. Toalhas, lençóis e Welcome Pack fornecido. O serviço de limpeza opcional Para os hóspedes que ficam mais de 7 dias roupa extra e toalhas estão disponíveis, portanto, se você não quiser ser incomodado você é capaz de mudar a roupa de cama e toalhas. Se você deseja ter este feito para você um número de contato é fornecido no pacote de informações villa. Lovely clean and well equipped villa . Slight issue with the electrics which were rectified quickly. Peacefully area . Lovely views . Only negative side was the mattresses were not too comfortable . Wir waren zwei Wochen in dem Haus von Steve. Es ist mit drei Schlafzimmern und drei Bädern wirklich super geschnitten und auch der Wohnbereich ist großzügig. Alles war absolut sauber und gut ausgestattet! Toll ist, dass das Dorf so authentisch ist und die beiden Tavernen (beide fußläufig erreichbar) bieten echte zypriotische Küche! Der Mietpreis ist wirklich sehr fair und alles in allem waren wir rundum zufrieden. It's great to know that the local taverna's are supplying great value. 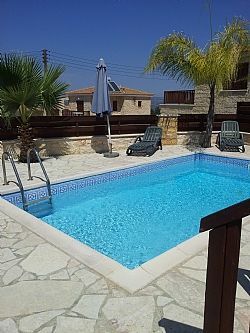 Just had an amazing holiday in Cyprus made all the better by the place we stayed whilst on our holiday. I reserved the villa on the back of the photos and reviews about the Villa and it was better then I thought. Steve, the owner could not have been more helpful and the facilities and the location of the villa was perfect. Really appreciated the efforts Steve took to make our stay easy. Highly recommend staying in Kallepia and at this villa. I am glad you had a great holiday in Kallepia and the villa exceeded your expectations. What a great place for a two week family holiday (Mum, Dad and three kids). We spent the first two weeks of August here and couldn't have chosen a better villa or location. Being up in the hills meant that we had a cooling breeze and were only 20 minutes or so from Paphos harbour. Two places to eat within walking distance and many supermarkets within 15 minutes' drive. The villa was as described and photographed; comfortable and well equipped. The pool was warm and, despite other houses being nearby, very private - not something all villas can offer. I'd recommend this villa without hesitation. I am really pleased that you and the family had a great holiday and enjoyed the less humid atmosphere in Kallepia and the typical Cypriot taverns in the village. We spent a relaxing week at Steve's lovely villa. The villa is spacious and well equipped and the views are amazing. Outside there are a number of areas to soak up the sun and enjoy a relaxing meal and a glass or two. Steve was really helpful and able to recommend places to eat out. Good news that you found the local restaurants good value and you managed to catch the late autumn sunshine! Lovely villa in a secluded location. We had a lovely and relaxing stay at the villa, which is a short drive away from Paphos (where you can get everything you need) in a more secluded and remote-feeling location. The villa itself was spacious, comfy and clean, with everything you'd need. We barbecued every night and found the weather in late October to be excellent, with barely any cloud and no rain until our last evening, temperatures ranged from the mid to high 20s, but it was cooler in the evening and the sun set around 7pm. The pool was very cold by that time of year but still made for a refreshing dip on the hotter days. The villa is part of a small group of houses, a couple of which were occupied during our stay. If they were all occupied, you may feel like the houses are quite close to each other, but they are designed so that you very much have your own privacy. The drive to the villa is steep but the route is simple, you will however definitely need a car if you're staying there. Overall, it was perfect for a relaxing week away where our priority was to lounge by the pool in a picturesque setting, and the villa was exceptionally good value. I'd also add that the owner Steve was very helpful in the buildup to our stay and assisted us with any questions we had. Glad you had a great time in Kallepia and enjoyed the lovely weather during October. We hope to see you again next year.